The brown F-8 Small Shoulder Bag - RuggedWear from Domke is a quality shooter's bag designed with a distressed patina finish that improves with age. It's designed to carry a host of photo gear including one to two cameras, two to four lenses, a flash, and accessories. The F-8 RuggedWear is made of water-resistant canvas material coated with waxes and oils. The fabric produces a unique distressed and weathered look. The open-cell foam construction on the bottom adds cushioning for additional protection when the bag touches the ground. The fabric has been manufactured with Domke's special non-solvent waxes and oils that provide long-term protection from harsh weather. The breathable fabric ages well but can be restored to its original look with the use of the included refinishing wax. Inside the bag is a removable partition for organizational purposes. Its three interior compartments and five pockets deliver excellent storage and additional organizational capabilities, for rapid access to the gear you need at a specific time. The renowned Domke Gripper Strap is tough and runs completely around the bag. The front flap protects the interior from water and is secured with Domke's traditional metal clip. Dual side pockets are secured with touch fasteners and contain enough space for accessories, like a flash or light meter. There's an additional zippered pouch stashed within the front weather flap. Domke's hardware is made for tough day-after-day use, in a bag that is extremely lightweight at a mere 1.4 lb. If the bag gets dirty, it can readily be cleaned with a hose, damp cloth, or soft scrub brush. Saddle or flake soap also works well. Domke does not recommend machine washing the bag. The name Domke is synonymous with bag quality. Their bags have graced the shoulders of photojournalists from all four corners of the planet for decades. Backed by a two-year warranty, the F-8 delivers quality and functionality that underscore the Domke reputation. FAA and airline carry-on specifications are subject to change without notice; please check with your airline before designating this case as a carry-on item. Most airlines require carry-on items to have an external linear measurement that is equal to or less than 45". The external dimensions of this case add up to 21.25". Box Dimensions (LxWxH) 9.5 x 7.0 x 4.1"
F-8 Small Shoulder Bag - RuggedWear (Brown) is rated 4.6 out of 5 by 33. Rated 5 out of 5 by Picturetakingone from Perfect for Light Travel I purchased this product because I was going on a cruise and wanted a bag that would carry only my camera and the essentials. I needed light weight and durable, and waterproof. It was perfect for the occasion. I have a d300 Nikon with a 18-200 lens. It fit perfectly (when I removed the dividers)with no excess room. I have a removable strap by Black Rapid that has a mesh carry bag. I strapped it to the camera and used it when I wanted a strap around my neck. I was able to carry my camera everywhere, and the case fit perfectly across my neck and fit under my arm. I got more pictures because I was able to carry it everywhere without fatigue. Rated 5 out of 5 by Vincent from Great Bag Mirror-less Home Great bag. This is my 5th Domke that I own. This is slightly smaller than my Billingham Hadley small bag. It contours to your body at the sacrifice of padding like the Billingham. I have my Leica M-E rangefinder with 35mm lens attached and a Leica 90mm lens to one side off the bag. You could probably get another lens in the bag if you are one of those people that like to smash as much gear as you can. You can also stuff gear in the two outer pockets. Bag is nice and lite and comes with a can of wax. The bag is pre-waxed however I did a wax job on it as soon as I got it. 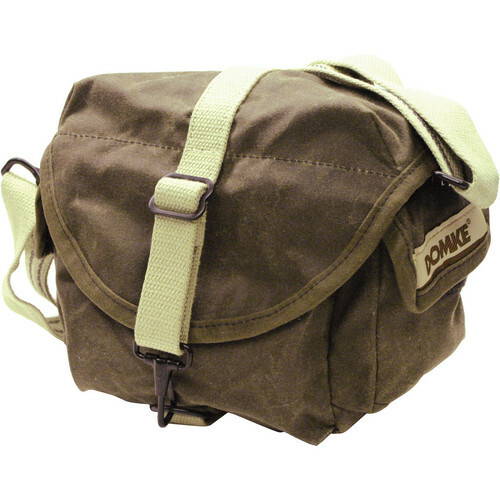 I like Domke because they look very inexpensive and really does not shout camera bag. They look good on you when wearing casual clothing. Rated 5 out of 5 by Chris from Just holds my prime lens kit A T3i with attached small prime lens (85mm, lens pointing down) fits in the main compartment along with another small prime lens (28mm, under the camera next to the other lens). The 50mm f/1.8 just barely fits in one of the side pockets, while the extra battery and charger fit in the other. A couple filters fit in the front pocket and a small notepad can fit in the back. The zipper pocket in the cover can hold some extra memory cards and cleaning cloths. It's a tight fit with everything, but I normally don't carry it all; it's nice for traveling light. The bag is built well, but not heavily padded. The finish is nice, water resistant, not waxy or greasy. Rated 5 out of 5 by AC from No ordinary camera bag ! Looks awesone, without appearing flashy, light weight; Compact, fits Nikon D3100 with fitted lens 18-55mm & fitted nikon lens hood ; alongside, my other accessories fit too - battery, charger, additional medium size lens, camera cleaning kit, basic camera lens filters, ultra compact point & shoot camera & a few more little things! One little observation - The hook provided is sharp on the inner side & rigid for the press. It takes a while to get used to the usage. Once you get used to it, you'll be fine ! Rated 5 out of 5 by Richard from Great little bag! Awesome for a small mirrorless setup. I carry my fuji x-t1, 18-55mm, 35mm, 18mm, small flash, batteries, go-pro, pocket knife and still have room for other stuff. Sweet little street and/or travel bag. The waxed canvas looks vintage but holds up really well. This bag feels very well made and burly even though it is light, compressible and smart looking. I highly recommend this bag if you are looking for something smaller yet capable. Rated 5 out of 5 by Nadav from Great little bag I was looking for a camera bag that will hold my NEX-5N with 3 lenses: 16mm, 18-55mm and 55-210mm but still be as small as possible and, while I'm at it, will look good. The Domke f-8 preforms on all of these, and I still have room for an extra battery, filters and probably the charger as well. The compartments inside the bag are attached with Velcro so they're adjustable to whatever you wanna put in there and it's waterproof! what more could I have asked for? Just keep in mind that this bag is fairly SMALL. No room for big eternal flash or your lunchbox. if that's what you're looking for - you're in luck. Rated 5 out of 5 by Steve from Great small bag Highly recommended if you need a small bag. This was just what I was looking for - something just large enough for my Rebel T3 w/ kit lens. I even might be able to squeeze in an extra lens. I have a backpack for carrying around more gear, but I wanted somehting small to sit on my desk or in my car seat and not take up hardly any room. Padding is great and bag has a nice vintage look. Doesn't look like a camera bag or a purse, which is a nice change from most bags. Domke is high quality. Can't go wrong as long as you know you want this size: small. If you have a larger DSLR like a 7D or want to carry extra gear in the bag, move up one or two sizes inthe Domke line. If you just want to carry your Rebel or similar DSLR (w/ short lens)... and maybe squeeze in a zoom lens... plus space for a few items in the pockets, like extra battery, charger, filters, etc... this bag is a great choice. Also very water resistant (I tested!). Rated 5 out of 5 by Nicholas from PERFECT SIZE FOR MFT!!! I recently sold my DSLR gear (5D and a couple of L lenses) and bought an Olympus OM-D, the Panasonic 14mm and 25mm, the Olympus 45mm, and an old Canon FD 135mm with a MFT adapter. My old bag was WAY TOO BIG, so I did a ton of research on bags (forums, reviews, etc). First of all, I absolutely love the look and feel of the Domke Ruggedwear bags, so it became a matter of choosing which Domke bag to buy. I did not want a bag that was too tall since I wanted to avoid having to pull everything out to get to the lens I wanted. I also wanted a small bag that could fit the items listed above (plus the charger, the OM-D flash, and a little room for keys, phone, etc. This bag is just the ticket! In the main compartment I have the 135mm FD lens on one side, the 14mm and 45mm on the other, and the OM-D with the 25mm mounted pointing down in the center... that pretty much fills up the center compartment. The charger lives in one side pocket, charger cord in the front pocket (with extra room for cards, keys, etc), and the flash is in the other side pocket. Finally, I slip an iPOD in the rear pocket. All the gear is easily accessible, fits nicely (not too snug, not too loose), and best of all, is small and light and a joy to carry all day! In you plan of carrying any more gear than I listed above (extra body, more lenses, etc) you will either need a slightly bigger bag, or pick and choose what you take and what you leave at home (I also have a Canon FD 200mm that I can take along as well in the main compartment if I put the 135mm in the front pocket (yes, it does fit). That is a body and 5 lenses in a very compact bag... I love MFT! I highly recommend this bag to anyone with similar gear and needs as I described above. The description for the F-8 says that a hand strap carrying handle is included. But in one of the reviews the reviewer said he bought an accessory hand strap, implying that it is not included with the bag. Is the hand strap carrying handle included? If it's the one pictured on the image, then yes, I got it. Will a Fujifilm xt-2 with vertical grip and 18-135mm lens fit in this? I'm ok if it has to stretch to do so. The interior dimensions of this bag are 6.5 x 3.5 x 6.5 (16.5 x 8.9 x 16.5 cm), please compare these dimensions to your camera. This camera bag would easily hold all of your gear and still have some room left over for other items you may still need to stow. This is a two part question. 1.) Are the inside dimensions given in the specs sections of this site accurate? 2.) Does the RuggedWear version ship with two dividers like the pictures show? Interior dimensions for the F-8 Small Shoulder Bag RuggedWear are as follows -6.5 x 3.5 x 6.5 The F-8 Small Shoulder Bag includes two adjustable/removable interior dividers. Previous question: I have a Canon 60D with a Sigma 18-250 lens, I carry a couple of backup batteries and charger, a couple of filters and the camera instruction manual; will it all fit, or should I go one size larger?Larry Answer: Yossi O from B&amp;H Photo Video said: This camera bag would easily hold all of your gear and still have some room left over for other items you may still need to stow. Followup question: what happens if i have a second Canon lens 18-135, will i still be happy with the bag? And, was your answer based on a dismantled camera or one fully ready for picture taking? Yes, you would have room to stow a second lens such as the 18-135mm as well. My previous reply was in consideration of your primary lens left attached to the camera ready for taking pictures; this reply also takes that into consideration.